Organise your accounting data, including your accounts receivable, in one place with QuickBooks. It makes accounts receivable management easy - automate invoicing, tracking and reporting. View your A/R Aging Report and other financial reports anytime, anywhere. Accounts receivable is money owed to you by your customers for goods or services that have been delivered or used, but not yet paid for. Accounts receivable are created when a customer purchases your goods or services but does not pay for them at that time. Businesses with accounts receivable typically issue invoices for their products or services at a later date. Accounts receivable is recorded in a business's accounting data as an asset. If a business has too many accounts receivable, it may not have the cash it needs to pay its bills. It's important to manage accounts receivable in order to maintain strong financial business health. QuickBooks organises all your accounting data in one place so that you can easily manage your accounts receivable, accounts payable, invoicing, bookkeeping, and more. Access the A/R Aging Report (accounts receivable aging report), create and send invoices, and send reminders to customers with past-due payments anytime with QuickBooks Online. Accounts receivable management is a critical component to managing your business's financial health. You can speed up accounts receivable by invoicing customers regularly, accepting cash and credit cards, and by using discounts to encourage early payment. Effective accounts receivable management will help you collect money from your customers so that you have enough cash on hand to pay your bills and your vendors on time. QuickBooks Online is the easy way to automate and manage accounts receivable. 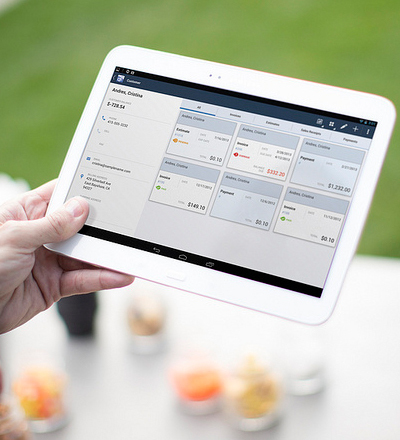 You can set QuickBooks to automatically send invoices, track payments and generate reports. Easily identify your delinquent accounts and send statement reminders to customers with late payments. Access your A/R Aging Report (accounts receivable aging report) anytime and from anywhere to know which customers are late with their payments and by how many days. When you create an invoice for a customer, QuickBooks automatically creates an account receivable for you. When the customer pays, you will enter the payment on the Receive Payment screen located at Customer > Receive Payment. Simply choose the customer, the invoice number, and the amount paid, and QuickBooks Online will properly reduce the amount of the customer's accounts receivable.